Mike was away most of this week; traveling for work. It so happened that Krista and Adam were both at work one of the nights he was gone. I came home to an empty house with no one to have dinner with. This is the type of night I like to experiment with a new recipe. It is a great time to do this since I am the only one home so if the dinner is a flop there is no one to complain about it. And as the saying goes when the cat is away the mice will play. I was hungry for some fish and I had a small amount of salmon in the freezer, about a half a pound. The recipe that I wanted to experiment with called for a pound of salmon, but I decided to try it and cut the recipe in half and make it anyway. I decided upon this recipe because it had a variety of ingredients and it was something that was outside of my comfort zone. If you follow my blog at all you will know that I like to do that every once and awhile. I loved this recipe, nice flavor. 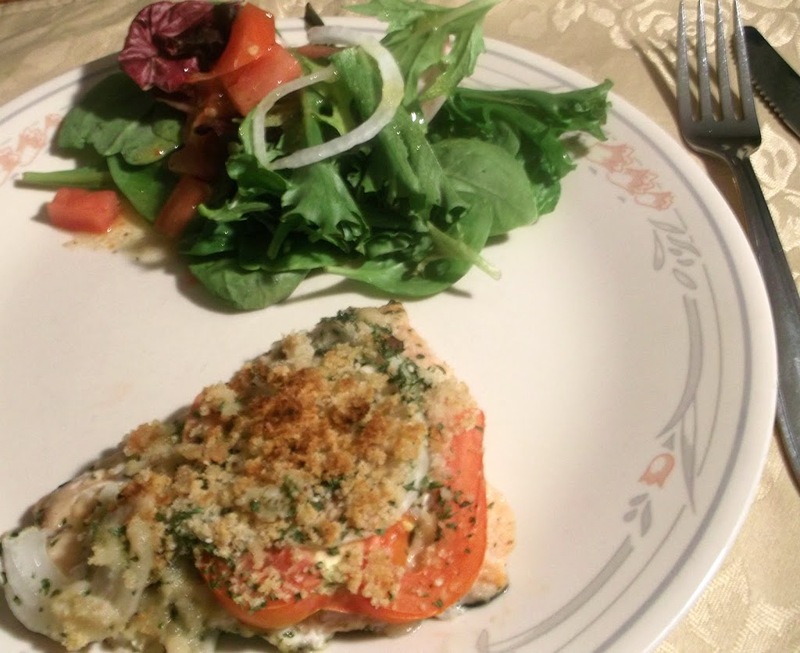 The herbs along with the onion and garlic gave the salmon great flavor and the bread crumb gave it that little crunch that is a good thing. I did make a couple of changes since I was lacking some of the ingredients. It took a little time to put it together, but the end result was well worth the time it took. Serve with a salad for a nice and healthy meal. 2. Add beer. If you have the dry white wine feel free to use that. (I know that beer is not the best substitute for wine, but it was all that I had in the house to use. And actually I think the beer was fine in the recipe). 3. Place fish in pan, and sprinkle with oregano, garlic, salt, and pepper. 4. Sprinkle with 1 teaspoon of lemon and 1/2 tablespoon of olive oil. 5. Top evenly with tomato and onion slices and chopped parsley. 6. Drizzle with remain lemon juice. 7. Mix bread crumbs with the remaining 1/2 tablespoon of olive oil and sprinkle over the veggies that top the salmon. 8. Bake in a 450 degree oven for about 8 to 10 minutes or until fish flakes easily. That’s the perfect time to try out a new recipe, cuz then if it’s good you don’t have to share it! 😉 So you grew up on a dairy farm in Wisconsin! I don’t know if you saw my post on Dairies, Cows, and Corn, but you might have some feelings about the topic. Thanks for stopping in. I’m your newest follower (especially since you’re really from Wisconsin). Hope you’ll follow back? I love just cooking for myself! The perfect time to try out new recipes. Your salmon looks flavorful and delicious! 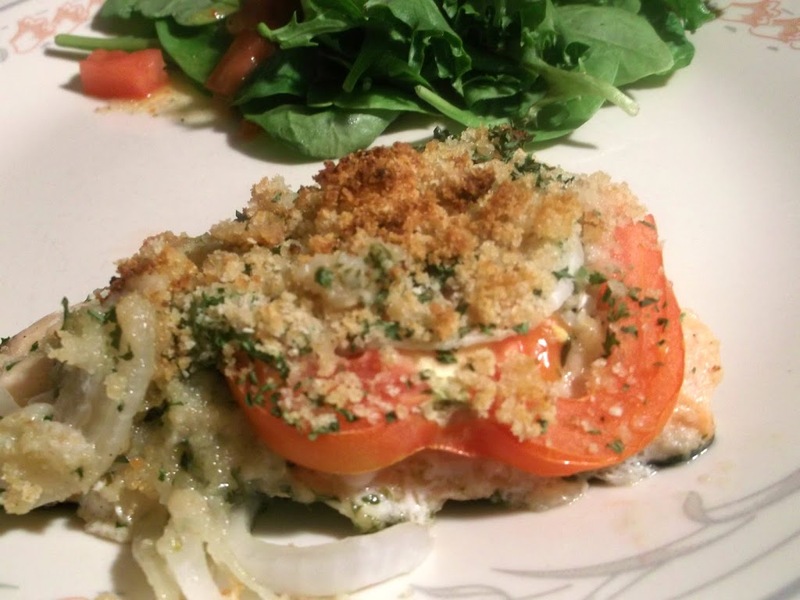 It looks and sounds delicious… I love the bread crumb topping. This looks absolutely delicious! I love salmon and am always looking for new things to do with it. Definitely going to try this! Beer-roasted salmon sounds great! 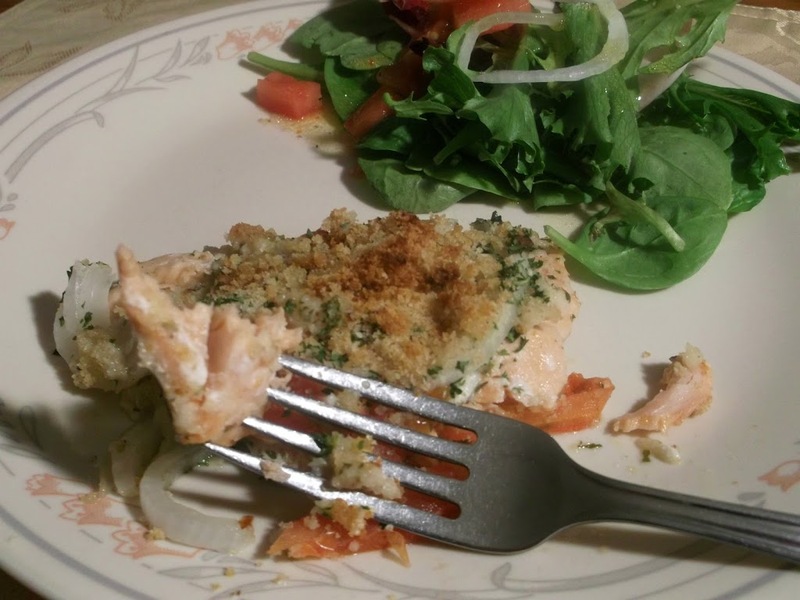 The liquid must have kept the salmon so tender, and the crispy breadcrumbs are a great contrast in texture. Thanks for sharing this recipe and hope you have a wonderful week ahead!